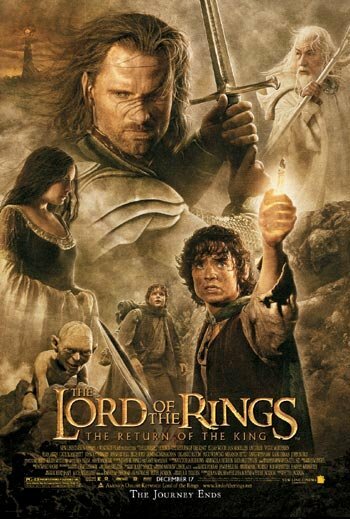 The final installment of the Lord of the Rings Trilogy seens the hardest of battles, the worst of betrayals and the most tear jerking moments. It not only concludes the story with a bang but is even more suspensful than the previous two. Okay so I have seen the movie yes and it is time for my review. First things first starting with the Soundtrack - I might not have review the other soundtracks but this one I will. I honestly love Billy Boyd's song and think it is beautiful and the high pitched songs where Gandalf deters the Nazgul as well as the heavy music about Minas Morgul are brilliant. I love this soundtrack it is on par with the other two as favourites of all time. Not as good as the previous two prologues, but sufficient none the less. I personally find the Two Towers Prologue face paced where as this one is a little slower though we do get to see how the ring corrupted Smeagol and turned him into Gollum. It also gives us the sense of the fact he is actually a villain. Whilst he might not have started out being one the Ring made him one. Though it is really cute when he pops his head down from the cavern roof "Come on Hobbitises. Wake up"
This part was a little disappointing we don't get to find out what happens to Saruman but I can understand why it was not including - we know that he has been defeated and has no power anymore - it is fitting for our 'heroes' to simply ignore him for the meddling old man that he has become. Edoras is sweet, Théoden acknowledges that Aragorn was the one that lead them to victory and the party is a nice touch of celebrations. Legolas looks very strange in that hood and I like the way Pippin gets the palantir as it is quite funny then horrifying when he gets taken by Sauron. Though I'm hoping to see Legolas and Gimli drinking game in the extended edition :) Merry and Pippin being parted is quite sad and moving - I quite liked this bit. The Pink Orc is kinda neat though they take over Osgiliath (Gandalf chasing off the Nazgul was neat) with so much ease then Denethor has the hide - the hide to tell him to go back and how he would rather Faramir and Boromir's places had been reversed. Then he has the hide to ask Pippin to sing for him whilst his only remaining son rides to his death - no wonder Pippin happily lit the beacon - Denethor is crazy. Pippin singing - awe isn't it sweet! Oh WitchKing - ohhhhh. He is really neat I love the music, the Fell Beast, the screech even the statues out the front are neat. This works brilliantly and the fact it shifts back to Pippin and Gandalf when the light spikes into the air is really good. And isn't Gollum wickedly evil? Setting Sam up like that - you really feel sorry for Sam (though not even an inch for Frodo). And Shelob is delightfully scary - especially when she is creeping behind Frodo - that's just plain FREAKY! Galadriel helping Frodo up was a nice touch - I liked that and I wanted to get up and cheer when Sam attacks Shelob and later attacks Gorbag as well. Go SAM! Merry is adorable in his Rohirrim outfit - how cute though I really feel sorry for Éowyn when Aragorn says "thanx but no thanx" poor woman - no wonder she wants to ride to war - nobody seems to want her. Elrond giving Aragorn the sword is neat but it is the Armies of the Dead that had me excited. After Helm's Deep this bit was the part I was really looking forward to and I can say yep - it's perfect. 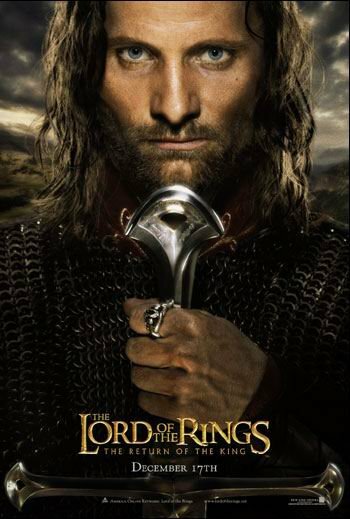 The dead look amazing and Aragorn plays them perfectly - I just love it. Best bit in the movie by far - gruesome yes but amazing too. I even love the concept of them. And when they get off the ships - I thought that was just neat - the Orcs didn't have a chance. Funny thing is the army is more effective dead than it ever was alive. Sappy yes - not as exciting as the battle but I love Sauron's eye moving around like a spot light - that just looks neat and Sam picking up Frodo is ever so sweet. Aragorn takes the mantle of King and goes to divert Sauron's attention to give Frodo a chance - so very noble of him - I especially like his armour :P Gollum on invisible Frodo is absolutely hilarious - I was in stitches then his elation at getting the Ring - then he dies - yeah I knew it was going to happen - but... I do have a question what the hell was Frodo thinking when he decided to take the Ring for himself in the middle of Sauron's stronghold? hello any brains in there? The Eagles are neat - they looked really good in the Mount Doom backdrop - exactly like the John Howe paintings! The meeting with Frodo waking up was a little corny but ohhh Aragorn as King - he sings beautifully too :) I'm not overly fussed on the crown but it DOES look like Elendil's so I guess that's okay then. Eyebrows raised at Éomer as King and Éowyn standing with Faramir (hopefully get to see the House of Healing in the SE) but the cake goes to Legolas! I mean Prince Legolas - if he looked like that the entire film he might have even more fan girls! Arwen looks beautiful of course. 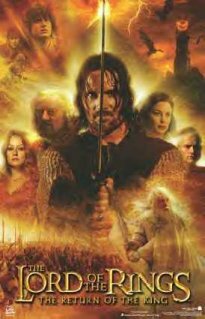 I liked the coronation it was a nice little ending for the majority of the Fellowship, Aragorn becomes King, Arwen Queen, Éomer King, Éowyn and Faramir. We started in Hobbiton and hear is where we leave, the Hobbits return and everything is the same (kinda glad Scouring isn't in it) Sam marries Rosie (very sweet) then they travel to the Grey Havens Galadriel finally gets to go into the West and in a touching moment Frodo leaves as well. Quite a nice little ending too :). Arwen in the forest seeing her son was kinda nice though I had to stifle a laugh at Figwit's appearance - go PJ! The banter between Legolas and Gimli is neat yet again though I did get a trifle bit annoyed at Frodo. Can't wait for the Special Edition to come out - I wonder what sort of things will be added to the movie and I'm up for all the other deleted scenes and bloopers I want bloopers!